Always scrub potatoes before cooking to remove impurities. You can whip any type of potato, but the results may vary, depending upon how much starch they contain; the less starchy varieties are waxier and more prone to over-whipping and turning into a sticky, unappetizing mess. 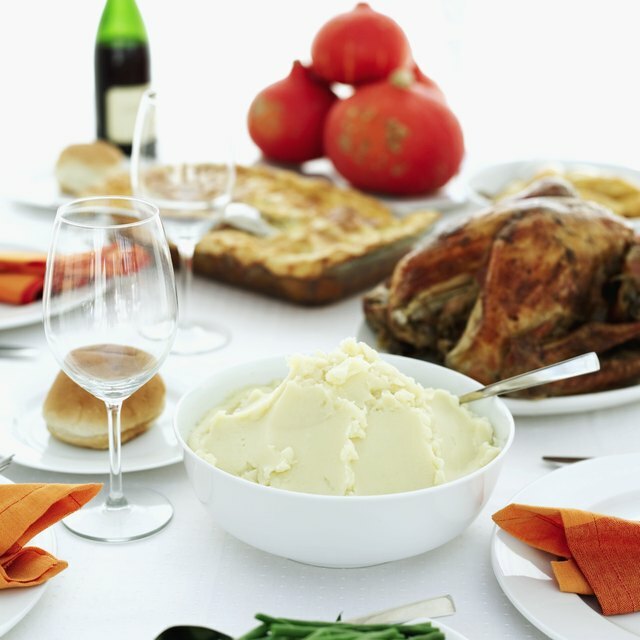 To make fluffy, light whipped potatoes, choose the variety that works best for you, cook the potatoes for the correct length of time and use a light hand when beating. There's a potato to suit any occasion, and grocery stores often stock the different types separately, which allows you to readily note the differences between them. Stores at times also provide information signage to help you decide which type to buy. Russets are long, flat, have rough, grayish-brown skins and contain the most starch. The cooked pulp is soft and dry and becomes fluffy when whipped. 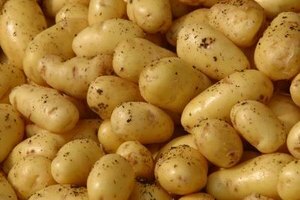 Moderately starchy potatoes include the all-purpose round white and red varieties and the Yukon gold, whose flesh is yellow and has an almost buttery taste. How you handle the potatoes before whipping affects the final results. As with all produce, rinse them well and scrub the skins to remove any dirt or pesticides. There are no hard-and-fast rules as to whether you should peel them first or cut them up before cooking. If you do cut them up, keep the pieces large and evenly sized, as smaller pieces are easier to overcook and absorb too much liquid, which causes them to turn to mush when whipping. Cook the potatoes until they are just fork-tender, and drain completely. Depending on their size, this can take from 15 to 30 minutes. If you can't whip them up right away, turn the burner off, drain the potatoes, place them back in the pot and leave them covered on the stove burner over very low heat to keep them dry. You can also place the bowl of drained potatoes over a pot of hot water and cover them with a towel to keep them warm. Heat whole milk, cream or half and half and butter in a separate pan and add to the potatoes. For 2 pounds of potatoes, plan to use about 1 cup of milk and 1/2 stick of butter, adding more milk or cream in small amounts if the potatoes seem too thick. You can also heat the milk and butter in the pot you cooked the potatoes in and return the drained potatoes to it. Season with salt and pepper and whip the potatoes using a sturdy wire whisk, a large fork, a potato masher or a hand-held electric mixer. The whisk, fork and masher offer you greater control over the process, but no matter what you use, stop as soon as the potatoes are fluffy and light.